I thought I’d take a moment to review the yarn I’ve been working so much with lately: Comfy. After all, with thousands of stitches now under my belt with the shawl (which is blocking right now, yay! ), I’ve had a lot of time to become intimately acquainted with the yarn. Comfy is 75% Pima cotton and 25% acrylic. The color I’ve been working with is called Seraphim. When it first arrived, I thought it was gorgeous and perfect. It’s still gorgeous and perfect, but I’ve stared at it so long that the colors are now dull. (They’re not really, but I bet you get what I mean.) Anyway, color spot on for what I wanted. 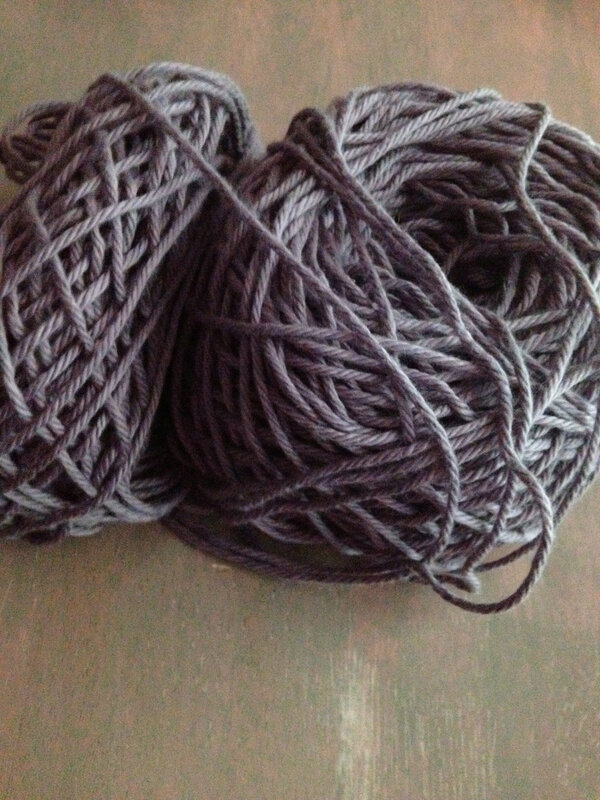 The yarn is also very soft, but doesn’t seem to have a ton of structure to it. When I use my ball winder to wind wool, I get a somewhat sturdy center-pull to work with. I couldn’t keep the Comfy to stay together in a center-pull. I ended up winding the yarn, putting it in a plastic baggy, and using the yarn like that, with the yarn coming out of a small opening in the bag. It kept the yarn from going absolutely haywire. Unfortunately, it took me a while to come up with this idea. The fuzz, oh the fuzz! While working with the yarn, I didn’t really notice just how much fuzz came off of it unless I was wearing my black work pants or if I touched my face. Then, it’s everywhere. I feel like I breathed in a good portion of the fuzz; it drove me crazy. It’s a little difficult to block, too, but I mostly chop that up to my inexperience with blocking anything. Now the positives! This yarn is really super soft. I didn’t really appreciate it until after I finished the shawl. It’s much softer than I anticipated the cotton yarn to turn out like. The stitches are also holding their definition so far pretty well. We’ll see how it is once everything’s done. Overall, I would probably buy this yarn again, but for a smaller project and in a much brighter color. I have my eye on the color Rosehip, which is so vibrant. It’s very soft like I said, so I wouldn’t feel bad about using it for baby items. I haven’t washed my swatch, so I don’t know how the yarn will hold up in to washing. I may try that this weekend if there’s any time. One more quick thing: Can you keep a secret? A little, absolutely adorable girl fell in love with Chadwick from first glance. Because it went to a basket for Employee Awards Day, I doubt she’s going to get him. That is why I started another bug last night. I made pretty good progress; I’m almost halfway through the third bump. I’m going to be working a lot on him to get him done as quickly as possible, which shouldn’t take nearly as long this go-around now that I’m pretty familiar with the pattern. Okay, I won’t tell, but I will say that I think it’s so kind of you to make another Chadwick for her. I tell ya, any kid that falls in love with my knitting is a kid that will soon be covered in as many handknit things as I can churn out. I couldn’t agree more with wanting to just knit everything up for kids like that. It was so funny because we had assembled the basket with Chadwick in it, and she and her mom had come to visit her grandmother. Well, this precious little girl doesn’t even say hi to grandma, but goes straight for Chadwick! 😀 Melted my heart.